Want to get rid of ants in your house or yard? 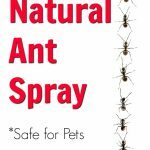 A natural ant spray made with nontoxic ingredients is the best way to kill ants and keep your family, kids and pets safe and healthy. Thankfully, there is a super simple DIY ant spray solution that is highly effective and is safe for pets and kids. Ants are generally killed either with ant baits or ant sprays. 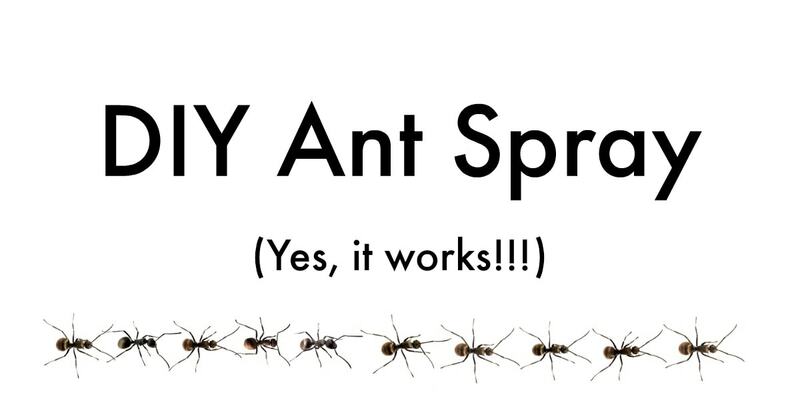 This DIY ant spray is geared towards the first scenario, random ants in your house or patio. 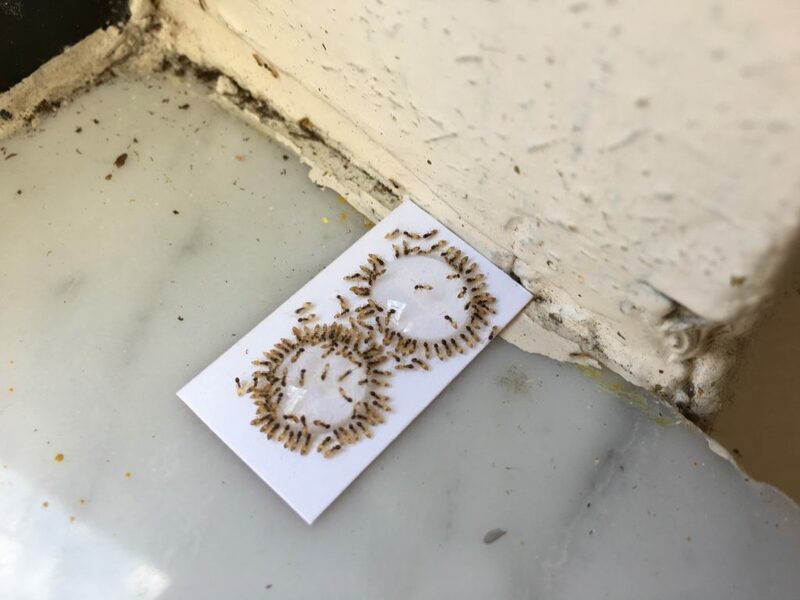 While the ant spray will definitely work on the ants that are infesting your home or yard, it is only a temporary solution. You will still need to take care of the source of the problem, which could be food attracting ants, gaps in your floors, rotting wood, imbalanced pH in your soil, etc. If you have a relatively clean house, though, and would like to kill ants in your home that you see occasionally, then this DIY ant spray is ideal for you! Sprays can kill the ants on contact when you see them. Ant baits are set out to attract ants and have them feed on a product that contains a substance that will kill them later. Ant baits can be problematic if you have pets. Dogs and cats can find the ant bait and eat the insecticide, which can cause health problems or even be fatal. Which is why controlling an ant problem with natural remedies is always the best idea. Especially if you have pets or small children that are on the floor. Always use prevention as the first method to get rid of ants. But we live in a world where natural elements are ALWAYS going to get into our home. It’s just nature. So this ant spray is how to be prepared when those rogue ants find a way into your home or march across your picnic table outside. Seriously, this DIY ant spray couldn’t be more simple. And you have no excuse to NOT try it. Everyone has dish soap in their home. And water. That’s all you need. So your excuse for NOT trying this safe way to kill ants pretty much doesn’t exist! How much dish soap should you mix with water to kill ants? It’s not a hard and fast rule. Don’t worry that if you don’t add in the exact amount of dish soap that your DIY ant spray won’t be effective. In general, I probably add about 10-20 drops of dish soap into a spray bottle filled 3/4 of the way with water. Don’t stress about the amount. If you do want to measure and make sure you have enough, then add 1 tsp. liquid dish soap into a standard size spray bottle (the kind that you’re probably going to find in the housecleaning aisle or beauty aisle). Keep in mind, you don’t want to add a ridiculous amount of soap into a spray bottle for this DIY ant spray. So DON’T dump in a cup of dish soap with a little water, thinking that it will work better. It won’t. You’ll just have a gunked up spray bottle and a soapy mess to clean. Shake up the bottle after adding dish soap and water together and attaching the lid. You should see some soap bubbles form inside. Give the bottle a quick shake before using again. You can use any type of dish soap for this DIY Ant Spray. Definitely don’t go buying something that you already have on hand. That being said, the more nontoxic and natural your dish soap is, then the more nontoxic and natural the ant spray will be. If you have a dish soap with lots of artificial fragrances and harsh chemicals, the DIY ant spray will still be WAY more safe than any chemical-based any spray. Yet, if you choose a natural ingredient soap (I used Seventh Generation dish soap with great success), then the DIY ant spray will be even more natural and safe. It’s really a matter of better and best. Making your own DIY ant spray is way better than buying most commercial ant sprays filled with chemicals. You’re already winning at creating a home that is safe for pets and your family. But choosing a natural dish soap will step up your game and really create the best all natural ant spray safe for pets. Do I Have to Wipe Off the Ant Spray? 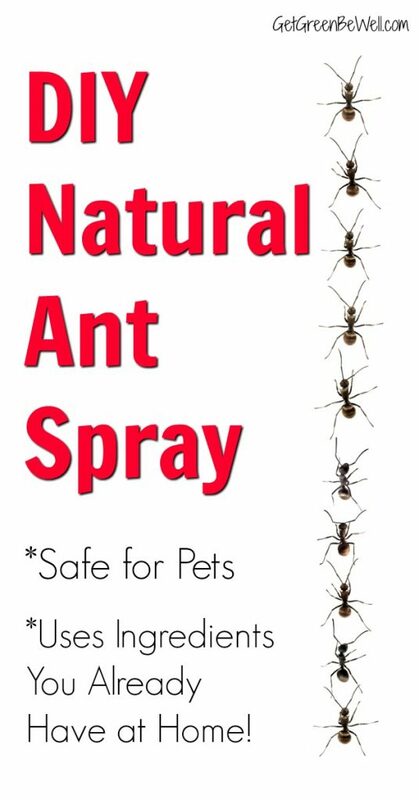 This nontoxic ant spray only has ingredients typically used in cleaning. So you don’t have to worry about wiping off a chemical exposure which would not be safe for pets. However, using this ant spray will leave a trail of dead ants behind. And possibly a soapy residue. Just take a rag and wipe down the area indoors to get rid of the ants. You can even use the same DIY ant spray since it’s a soap and water solution. Wiping down the area will also get rid of the trail that the ants were following. Which means no ants (or fewer ants) later. Living in Florida, we almost never get a break from the insects outside. It never gets cold enough for them to hibernate or be killed off for the season. After one too many afternoons ruined by ants marching across my feet, we tried out a plain old soap and water to kill them. Lo and behold, the soapy water ant spray killed them in an instant! And I didn’t have to immediately leave the area after spraying because I was worried about inhaling chemical fumes or the nasty smell of bug spray. So we sat on the porch, cocktail in one hand and a bottle of DIY ant spray in the other. When an ant would dare to come too close to my feet, I would simply squirt with my spray bottle and it would be taken care of immediately. I didn’t have to leave the area. There wasn’t a nasty smell to ruin the mood. I didn’t have to worry about the spray getting on my skin or pets around my feet. My only problem with this all natural ant spray is that it sometimes work on red ants and sometimes not. All other ants seem to be killed immediately using soap and water. But red ants are nasty little insects that don’t seem to die as readily. We have also tried a white vinegar and water spray on red ants with mixed success. Because red ants can bite and cause physical reactions, don’t fool around with them. Use products designed to kill the red ant queen in the mound (use with caution around pets) or remove yourself from the situation. *FYI: We used a soap and water method to kill fleas, too. My mom used to comb my dog’s fur in the summer time looking for fleas. She would find them, pick them off, and then put them in a small bowl filled with soapy water. The fleas would die immediately, and my dog wouldn’t be exposed to any nasty flea sprays. If you STILL need an ant bait for some reason, I want to be sure to tell you about Terro ant killers. I first saw how effective Terro products were when my Dad put one in my mom’s car that was mysteriously infested with ants. (Still don’t know why that happened.) The ant baits worked like a charm with no smell. Because the worked so effectively, I thought for sure they must be toxic or using some nasty chemicals. While studying for my WELL AP exam, I was surprised to find that Terro was among the nontoxic insecticides suggested in the WELL Standards for creating a healthy working and living environment. Though it’s a nontoxic insecticide (I only use the baits and not the sprays), it’s still easy to find and affordable. I’ve bought them at Lowe’s and Walmart. Again, use caution around pets and kids, though. I got to know Terro really quick when we first moved to FL. I had never seen ants like I saw here. That stuff works great! Right!!!! Terro works amazingly well! That’s why I was so surprised to find it on the low risk products.